Monday, August 28, 2017 – The lazy Dog Days of Summer have been anything but for investors. Stock indexes were on the road to recovery early last week possibly from the celestial effects of the Solar Eclipse that captivated the nation’s attention. The market then sold off on concerns of the departure of key White House staff but nevertheless ended the week on a slightly higher level. US Benchmarks ended up with the S&P 500 closing at +.72% for the week to 2,443.05 and the Russell 2000 rising 1.45% to 1,377.45. The tech heavy Nasdaq Composite rose in line with the S&P 500 by a +.79% to 6,265.64. Investors continue to bet on Tax Reform this Fall and continued deregulation by Presidential directives. Sunday night it became apparent that the flooding from the Hurricane Harvey that hit Southeast Texas over the weekend was “unprecedented and all impacts are unknown and beyond anything experienced” according to the US National Weather Service. Consequently, potential loss of life, dislocations of people, property and infrastructure damage will likely be significant as those from Katrina and Sandy. The direct and collateral damage of Harvey will not be known until later this week. Financial Markets will reflect the consequences of the damage particularly around the Houston Metropolitan Area and coastal gas refineries. While September was already looking to be an exciting month to watch cable news with political haggling over raising the deficit ceiling and threats of government shutdowns – which have proven to be short-lived trading opportunities, this time is likely to be different thanks to Harvey. Why? First, the reserves of the national flood insurance fund are likely to prove inadequate to cover claims. This will open the debate of increasing deficit spending to bail out the fund. This is likely to fan the debate of climate change and whether taxpayers should bear the bill of rebuilding residences and businesses along the coastal areas. Also, expect damage to crops and refineries all of which will take the form of higher soft commodity and gas prices – as early as Monday morning. So look for the inflation rate to increase, but not for long hopeful reasons like wage inflation. The scale necessary to rebuild the region is likely to make the Fed think twice about rising interest rates due to the short term regional slowdown in economic activity resulting from the damages due to Harvey. A search of “politics of natural disasters” brings up a considerable number of studies both in the US and internationally of how unforeseen disasters have a way of affecting politics, in particular, having negative consequences for those in office. We need to look no further than the effect of Katrina on the Bush Administration although Trump appears to be trying to get ahead of the situation. The need to authorize spending for a big infrastructure projects should become inevitable as there will be plenty of “shovel ready projects.” Discussion about tax cuts was on the September agenda but could get pushed back in wake of the need to immediately address rebuilding concerns. Ready your popcorn and favorite beverage and tune into your favorite cable news channel to see how this unfolds. We continue to favor the Reflation trade on the expectations of tax cuts and big infrastructure spending. If anything, the damage from Harvey will eventually accelerate this trajectory if reason prevails in Washington. The continued decline of the USD from its highs since December could give investors with foreign ETFs a double reward, rising equity prices and an FX kicker as well. Our ETFG Quant Score list based upon Friday’s closing data does not yet reflect the effects of Harvey, so we suggest checking the daily movers list as the week progresses for new ratings. We favor infrastructure plays, energy and foreign markets. Looking at our Weekly % Movers list, we see IEQ and HAP as energy/commodity plays moving up in ratings as well as a good selection of foreign ETFs such as BRAQ, EUFN, EWT, and QEMM. Looking at our Select List, for Energy ERGF, EMLP, CRAK, MLPA, PXI are attractive in ratings in their respective sector. Others we think are likely to benefit are XTN, INDF in the Transportation Sector, MATF and JHMA in Materials, INDF in Industrials and FTRJ, FTAG, NFRA and TOLR in Natural Resources. We suggest looking over the Quant Movers % Daily when big events occur that affect financial markets to zero in on attractive plays and sudden changes in our ratings outlook. Monday, August 21, 2017 - Stock indexes were on the road to recovery last week and then sold off when the President’s comments on the previous week’s violent protests appeared to justify the actions of the “very fine people” of the Alt Right in Charlottesville. Such praise of particular groups has been off limits for traditional politicians for decades. The comments further caught GOP members off guard in what typically would be the slow dog days of summer as public opinion reaction gathered momentum leading to business leaders abandoning Advisory Boards. Culminating the week was the surprise resignation of Trump’s senior political advisor and campaign strategist, Steve Bannon. New terrorist attacks in Spain, and concerns regarding future actions by the Federal Reserve and the European Central Bank added fuel to the turmoil. While presidential decrees reducing government regulations continue to be issued by POTUS, investors increasingly question if big ticket items like tax cuts, infrastructure spending and health care reforms can be accomplished in this politically charged environment. US Benchmarks ended down with the S&P 500 closing down .65% for the week to 2,425.55 and the Russell 2000 dropping 1.20% to 1,357.79. The tech heavy Nasdaq Composite dropped in line with the S&P 500 by a minus .64% to 6216.53. Nevertheless the equity markets remain resilient despite increasingly political uncertainty in Washington. 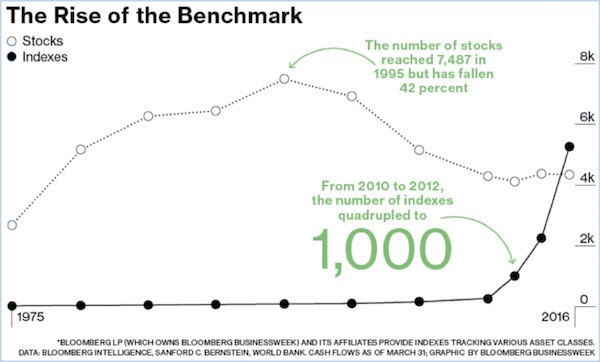 One thing we found of interest was the Rise of the Benchmark (Indexes) as show in the graph below. Due to the rise of ETFs, cheap internet trading and the decline of the number of publicly traded firms, indexes now outnumber publicly listed companies! It seems to us that the consequences of this are little known which is why astute investors are wise to note the particularities of the construction of the indexes that serve as the portfolio of the ETFs that they trade – something that we here at ETFG have been saying for some time and plan to provide you with more information on this soon. Indexes on, for example. a particular theme or sector can vary considerably. Nevertheless , we continue to favor the Reflation trade continue to believe that the animal spirits unleashed by the excitement of the GOP denominating the WH, Congress and Senate are alive and we would not leave the party yet, although some caution is warranted. The continued decline of the USD off its highs since December could give investors with foreign ETFs a double reward, rising equity prices and a FX kicker as well. Our Quant Score list shows several of the weekly movers are funds focusing dividends: SDY, JHDG, SDIV, FPE, and IQDE. Our Equity Select List shows ETFs with scores of 70 or better to have an overseas flavor: FNI, EWY, PGI, EWH, FXI, EWU, EDOM and AADR. This indicates that value has shifted to overseas markets from well performing US markets. Energy and Tech ETFs continue to score high as evidenced by CRAK, OIH and TCHF, KWEB, & XITR. We suggest looking over the Quant Movers Daily and Weekly % Movers to zero in on attractive plays and sudden changes in our ratings outlook. Wednesday, August 16, 2017 - New-to-Market: This blog series highlights ETFs that have recently gone public and reflect those strategies currently most in demand by investors. While ETFs are not eligible for ETFG Risk Ratings until traded for 3 months and ETFG Reward Ratings for 12 months, our goal is to highlight cutting-edge investment strategies that have recently embraced the ETF structure – we hope you enjoy this special series of posts! With over 2,000 ETPs listed in the US with nearly $3 trillion in AUM, it’s easy to think that almost every unique trade strategy has a product tied to it, but, the truth is that innovative products are often hard to find. The industry has come a long way from the standard index replicators; the strategic funds formerly known as “smart beta” have soaked up billions in new assets this year while social impact and multi-factor ETPs are all the rage. There was even a short period of time where 4x funds looked like the coming thing, but it seems that most new funds are simply variations on an existing theme; a different index here or an alternative weighting system there. A number of the ETPs on our list of recently launched products stood out to us, but one in particular, the Virtus Enhanced Short U.S. Equity ETF (VESH) might serve one of the most challenged segments of the ETP markets. Eight years into the second-longest lived bull market in history has made short selling less a “lonely” activity and more “suicidal” as tacking against the euphoria has generally been a career killer, leaving only a handful of funds for investors to choose from. Our database has 138 inverse products with a total AUM of almost $20B and excluding the levered ETPs, intended for short-term protection, brings the list down to 57 products with a total AUM of just $6.5B. Looking at funds that only give you exposure to the equity market, reduces the list of ETPs even further to only 26 leaving to risk-conscious investors decidedly lacking in options. The Virtus Enhanced Short U.S. Equity ETF (VESH) does things a little differently than most of the existing inverse equity ETPs in two unique ways. Levered or not, nearly all of the inverse equity products are passive funds that track specific, well-known market cap based indexes except for the AdvisorShares Ranger Equity Bear ETF (HDGE), an actively managed product that shorts individual equity names based on bottoms-up stock research. While VESH is also actively managed, it’s strategy is ‘rules-based’ and more in-line with its passive kin but while employing a more nuanced strategy than larger inverse funds. In fact, if those rules were wrapped into an index that went long instead of short, VESH would look more like a strategic beta fund that did sector positioning based on the popular momentum factor than anything else, except its focus is obviously on negative rather than positive momentum. Bringing strategic beta to the world of inverse ETPs might seem like simple evolution but Virtus has long been in the forefront of bringing the best of academia to the market. In most of the academic research around factor investing, researchers use market neutral strategies to test the viability of the factor which involves taking both long and short positions based on the factor being tested. Up until now, most ETPs have only used the long side of that research given that most investors, big or small, are typically only interested in long exposure. Recognizing an underserved market, Virtus has taken the unique position of giving investors exposure to the other side of the research in that short portfolio to produce potentially more symmetrical returns. Launched in late June of this year, Virtus brought the fund to the market with a simple goal; outperforming 100% of the total return of the S&P 500 Index and it does so by recognizing that, in the eyes of investors, not all sectors of the market are created equal. First, investors need to recognize that the fund is essentially two strategies rolled into one, with 50% in a monthly rebalanced short position against the S&P 500 while the remaining 50% is built around a sector rotation strategy, perhaps one of the most common and easily recognized investment strategies used by investment professionals. Rather than focusing on individual names like HDGE, at the end of each month, the GICS sectors comprising the index are ranked by their trailing 9-month returns with the 5 worst performing sectors being identified to be sold short using futures contracts removing the nonsystematic risk of individual stocks while simultaneously embracing a more contemporary strategy. 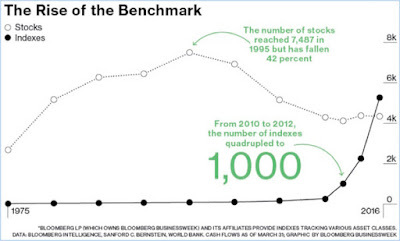 While the newly launched fund lacks a track record, it’s easy to see the potential advantages of such a strategy, especially in a market like we find ourselves in where even a 5% correction has become a distant memory. While the 50% of the portfolio invested in short S&P futures should help traders focused on hedging by keeping the fund in-line with the broader market, the other half focused on specific underperforming sectors could potentially reduce the drag of an inverse position on a broader portfolio in a rising market. Even in a year like 2017, there remains a wide degree of dispersion between sector returns with energy stocks deep in the red while real estate and consumer staples names continue to lag the broader market by hundreds of basis points. This dynamic, in part, helped VESH narrow its loss in its first full month of trading with a 1.17% loss in July compared to a -1.91% return for the unlevered ProShares Short S&P 500 Fund (SH). But it’s also easy to imagine how that could quickly lead to investors finding themselves with large, unintentional sector wagers as most of 2017’s laggards are in the smaller subsectors of the market. Energy stocks may be the biggest losers this year but make up less than 6% of the market while real estate and consumer staples stocks, the next two worst performing sectors, make up 3.5% and 8.5% of the market respectively. To keep that from happening, the short positions are weighted proportional to how much they make up of the S&P 500. In its first full month of trading, VESH was short all three of the above sectors along with healthcare and utility stocks and while investors might have wished for more energy exposure, the fund’s rules based weighting system kept the allocation just under 8% of the total fund. The other thing that VESH does differently than most inverse products is that it doesn’t have the daily reset that SWAP based products contain. The daily reset that SWAPs go through is what causes the divergence between their expected daily return target and their longer time frame returns. This reset compounds daily moves. Using fully collateralized futures positions that are rebalanced on a monthly basis, Virtus is trying to provide a product that can be held for a longer time frame while minimizing any divergence between the product and its target exposure of outperforming -100% of the total return of the S&P 500 Index. Finally, while the product is actively managed, it also has a relatively low management fee of 55 bps. This puts the product closer to the majority of long-only, passive strategic beta funds rather than existing short strategies which usually come with a higher price tag. In fact, VESH’s 55 bps fee is substantially below both actively managed HDGE (175 bps) or passive funds like SH at 89 bps, which significantly reduces the potential cost for those more anxious investors to hedge their equity exposure. So even if the broader market’s relatively flat performance, despite a summer of perpetual crisis in Washington and sabre rattling overseas, has some wondering whether we’ve reached a new “permanently high plateau,” know that a firm at the cutting edge of investment research has used the lessons of strategic beta to bring the first truly innovative inverse product to a market that might soon desperately need one.